Saturday September 7th 1889 It was a busy day. We washed & ironed some, dried a mess of corn, gathered tomatoes to put up, cleaned the summer kitchen and churned besides getting the work. We did not see any thing of the girls today. Weather cool and pleasant. 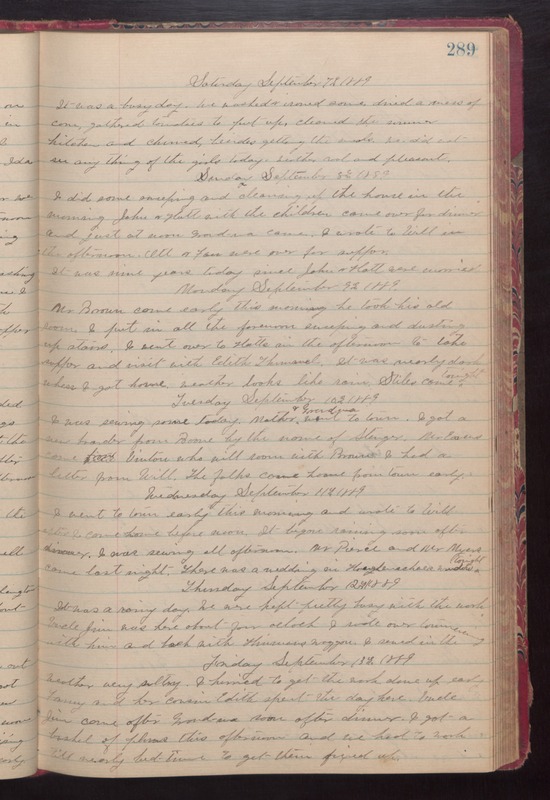 Sunday September 8th 1889 I did some sweeping and cleaning up the house in the morning. John & Hatt with the children came over for dinner and just at noon Grand-ma came. I wrote to Will in the afternoon. Ott & Fan were over for supper. It was nine years today since John & Hatt were married. Monday September 9th 1889 Mr Brown came early this morning. he took his old room. I put in all the forenoon sweeping and dusting up stairs. I went over to Hatts in the afternoon to take supper and visit with Edith [Thurmanel?] It was nearly dark when I got home. weather looks like rain. Stiles came tonight. Tuesday September 10th 1889 I was sewing some today. Mother & Grandma went to town. I got a new boarder from Boone by the name of Stenger. Mr. Eavens come from Vinton who will room with Brown. I had a letter from Will . The folks came home from town early. Wednesday September 11th 1889 I went to town this morning and wrote to Will after I come home before noon. It began to rain soon after dinner. I was sewing all afternopon. Mr Pierce and Mr Myers came last night. There was a wedding in [Hoeglenschaer?] window tonight. Thursday September 12th 1889 It was a rainy day. We are pretty busy with the work. Uncle Jim was here about four oclock. I rode over town with him and back with Thirmans waggon. I sewed in the evening. Friday September 13th 1889 weather very sultry. I hurried to get the work done up early Fanny and her cousin Edith spent the day here. Uncle Jim came after Grandma soon after dinner. I got a bushel of paums this afternoon and we had to work till nearly bed-time to get them fixed up.